Every artist finds certain materials inspiring– a piece of wood with remarkable grain for a carver, a shimmering stone for a jeweler, a beautiful new glaze for a potter, or a fountain pen that feels like it was made for the writer’s hand. I’ve experienced this many times in my career, finding inspiration in copper wire, pieces of slate, metallic inks, patterned fabrics, & most recently, an exotic sheet of handmade paper. I fell in love when I walked into a small stationery store that displayed large sheets of handmade & printed papers by draping them over wooden dowels, cascading down the wall like a multicolored waterfall. That’s when I saw it. A gorgeous fuschia, red, orange, & gold piece spoke to me from among the polka dots, paisleys, stripes, & florals. I didn’t know what I would do with it but I knew it had to come home with me. In my studio, I ceremoniously unrolled the butcher paper that wrapped my sheet protectively. I’m not ashamed to admit that I found myself talking to the paper as I revealed it. “Why hello, there. What would you like to be? A painting? A collage?” My eager questions were met with silence. This wasn’t going to be easy but most things worth doing and worth having aren’t. This paper was exotic & mysterious, and would remain so for weeks. I heard it, “Yes, a collage… something divinely beautiful.” That’s it. Divine. The Divine Within. Once I had the title, I remembered a sketch I had drawn months ago & ran to find it among the many notebooks, journals, & sketchpads I have stacked around my home. I found the small thumbnail sketch & knew for sure; that image belonged on this paper. And so, The Divine Within was born. 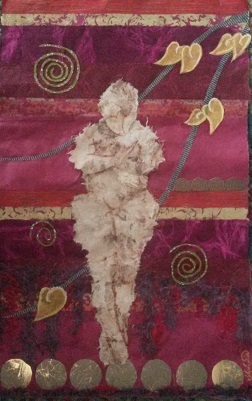 I used a variety of papers with textures tempting to touch, metallic gold ink, & creamy smooth oil pastel. The beauty of the paper is able to shine through, just like we are able to let our light shine when we choose. The Divine Within is within each of us. This entry was posted in A Window on Life, Art and Soul, It's All Connected: Spiritual Musings and tagged art, beauty, collage, creativity, divine, inspiration, life, reflections, spirituality, women by puresusan. Bookmark the permalink.